Our very first client’s mother visited New York recently and was floored by the work we did in his space. She joked that she would fly the three of us out to work on her house and thus begins our story. These empty nesters who have raised 5 successful men, needed an update to their family home in order to reflect a more current and sophisticated style they could relax and entertain in. The wife actually was considering moving in order to get the home of their dreams. The largest challenge we faced was that only one of us had seen the space for the consultation, all communication after the initial consultation was limited to phone, email and an idea board and that we only had 8 physical days to completely transform the upper floor of their home. The largest transformation of the top floor of the home was the main living area. All of the blonde pine was stained an antique walnut to create a richness to the existing wood. All the kitchen cabinets, base boards, window casings, and doors on the upper level were stained to create a beautiful through line the moment you walk in. The sitting room was completely transformed. The couple’s old couches were replaced with smaller, more structured sofas. Glass top round tables and octagon leather stools helped to break up the squareness of the rest of the furniture. Crisp white drapes were added to elongate and brighten the rooms. A Hollywood Regency-esque mirror was mounted to clear the top of the mantel which also received the antique walnut stain to tie in with the rest of the updated wood. Modern chandeliers were installed in the kitchen and dining room as well as a new fan to the sitting room. Using mixed metals and leather accents we created a sophisticated yet cozy glamour to the room. The couple’s collection of antique radios and family photos were added to personalize and round out the space. The antique walnut finish continued through the wood work in the house to the back bedrooms. Unlike the living room, the remaining rooms that we redecorated kept most of their original furniture. The couple were intent on keeping their master bedroom set. We used a fresh, sage green paint to brighten and lighten the room. From there it was about simplifying patterns and creating crisp, clean lines to showcase the furniture and the wood work on each piece. The arched window was framed with cream black out drapes and sheer privacy panels to elongate and add height to the room. The walk in closet received floor to ceiling shoe shelves to house a beautiful collection of shoes! The master bathroom was made into a spa oasis. 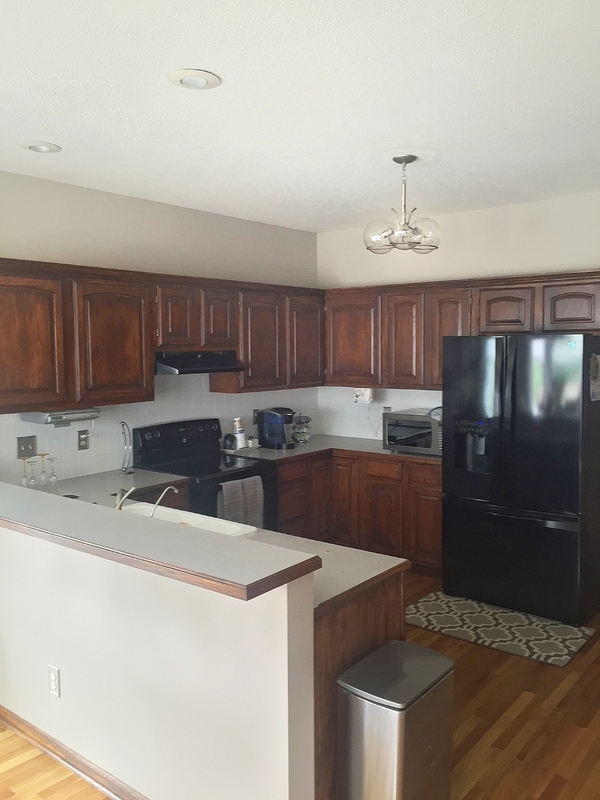 A warm, tan color was chosen to compliment the existing tile giving it a new sophistication. Everything else was kept simple and clean using creams, whites and ivories to accent the room. Candles and decorative accents of glass and ceramics were added to bring a feminine, airy touch to the whole room. 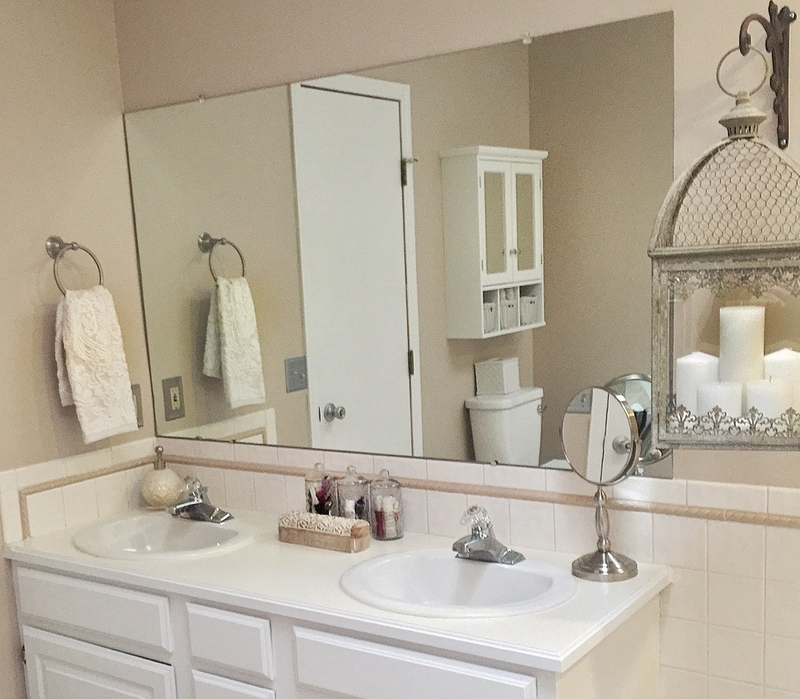 A crisp white bathroom cabinet was added for more shelving and storage above the commode. The cabinets and laminate were given a fresh coat of white and ivory paint to keep with the spa like theme. 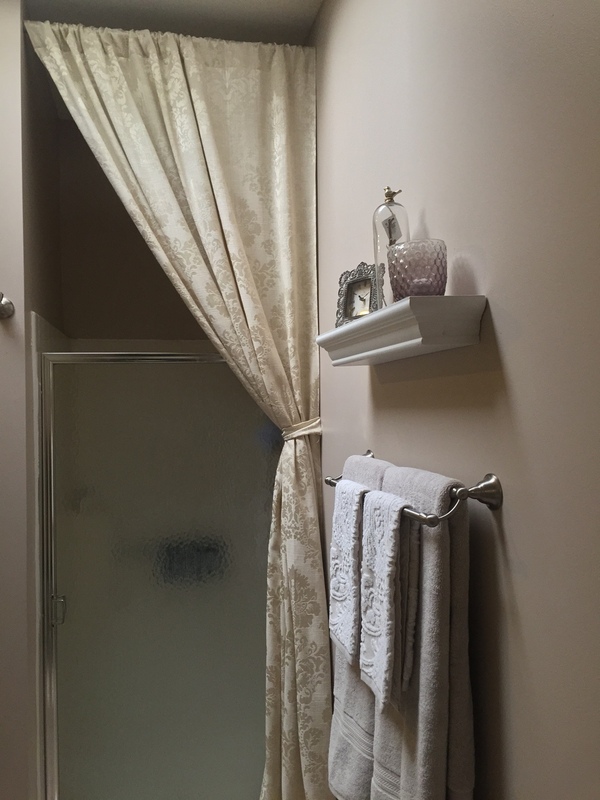 Finally a tall, elegant drapery was added above the standing shower adding a level of drama. 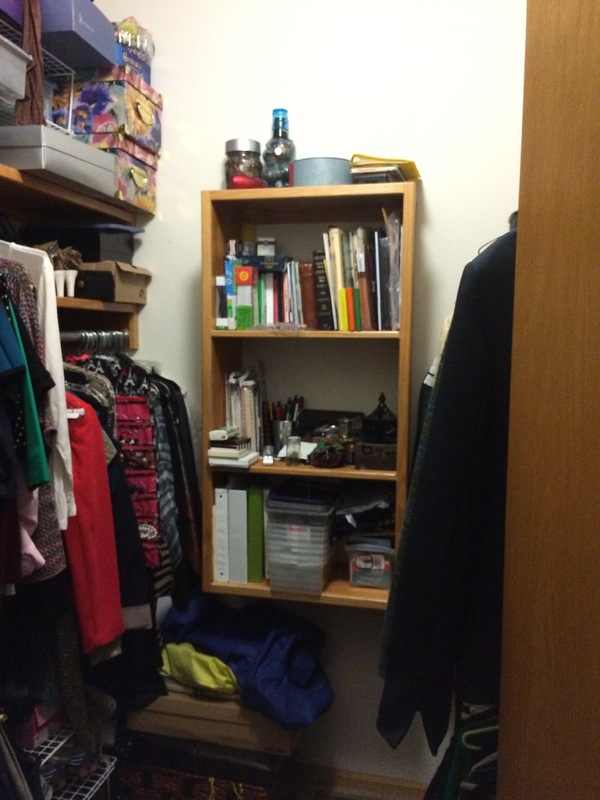 When first looking at the den the space seemed closed off and out of balance. Most of the furniture in the room was on one wall and covering the window and it was in opposition of a huge dual recliner. The room was in need of a cozy coat of paint to warm up the room. The room was rearranged to expose the window, which received more colorful, patterned drapes. 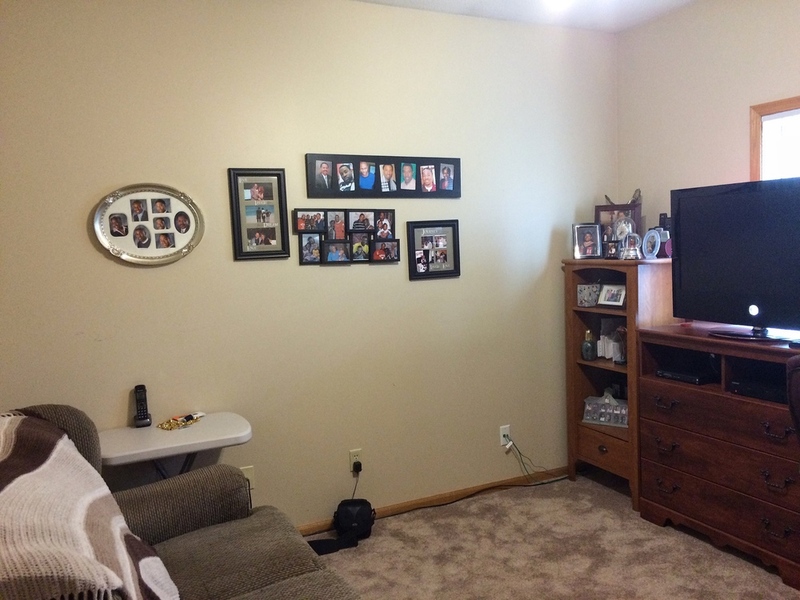 A pair of single recliners with a more structured look replaced the larger piece to completely update the space. 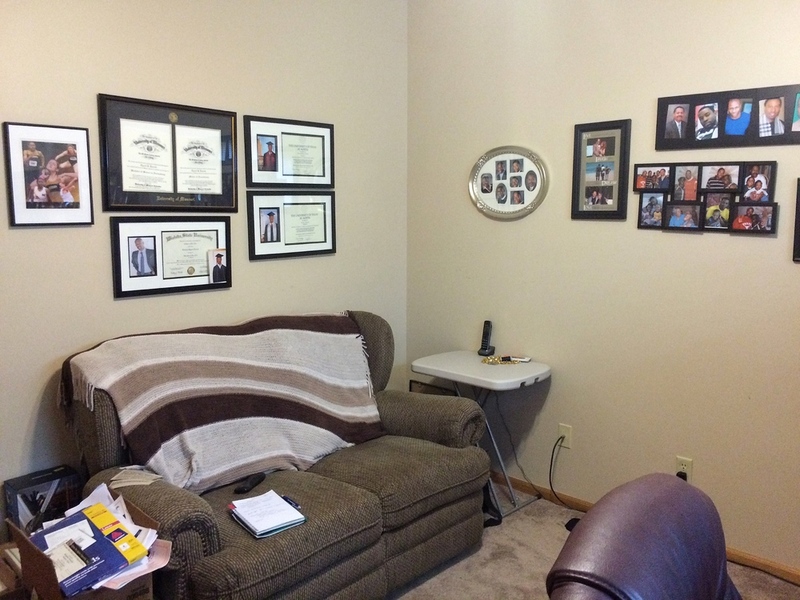 Family portraits and achievements were hung around the room as a gallery. A new lamp and side table along with pillows and blankets puled the space together as a place where the family can hang out together. The guest bedroom was added at the last minute. It’s amazing what new bedding and new drapes can bring to a room in a flash. A neutral navy and cream patterned bed spread updated the black and white bedding. 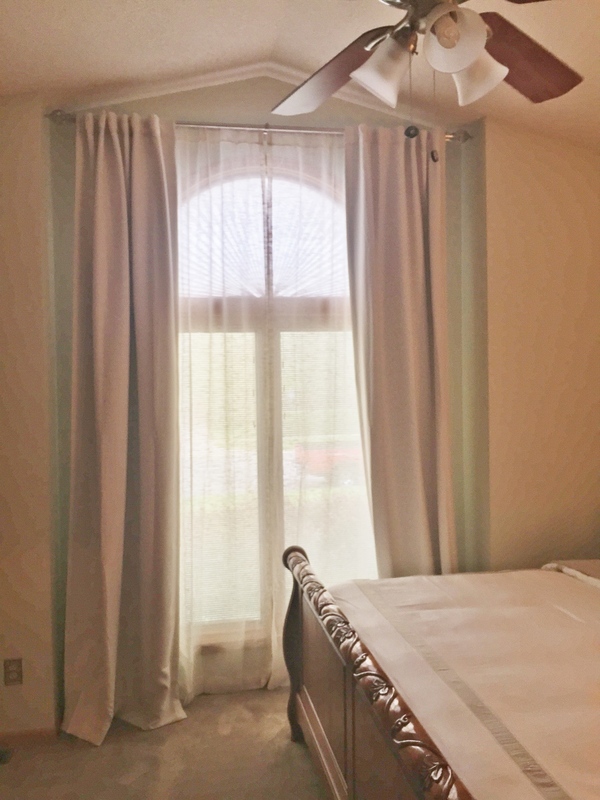 Complimentary navy drapes and a cream privacy panel added just the right amount of color while keeping things simple. A few cream and white throw pillow and the space is ready for any guest or family member to stay.